Plums are really fantastic right now and my local farmer's market has tons of them. Even the ones in the grocery stores are very good right now. I really wanted to make a plum dessert and specifically a tart. So I turned to Alice Waters and her beautiful book "Chez Panisse Fruit". This book is a must if you love to go to the market, see what fruits are in season but can't think of what do with them. 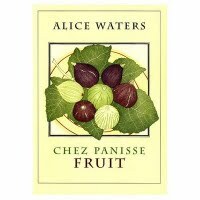 Alice Waters has the book divided by fruits with interesting discussions of each fruit and how to buy them, store them and cook them with really wonderful recipes. In fact, when Chez Panisse opened in 1971 and served their first dinner, plum tart was the dessert. I've loved all the tarts from Chez Panisse and this one is outstanding. Preheat the oven to 375 degrees. Cut the plums in half, remove the pits, and slice into 1/2 inch wedges. Arrange the wedges in concentric circles in the prebaked tart shell. Melt the butter in a small saucepan over low heat. Let it bubble gently and cook until the milk solids turn a toasty light brown. Remove the butter from the heat, add the lemon juice to stop the cooking and set aside to cool. Beat the eggs and sugar together with an electric mixer until the mixture is thick and forms a ribbon when dropped from the beaters, about 5 minutes. Add the butter, brandy, vanilla, salt, flour and cream. Stir just until mixed. Pour the mixture over the plums, filling the tart shell. Cover the tart crust with a pie crust shield or, if you don't have one, just use strips of foil. The crust will be too brown if you do not. Bake in the top third of the oven until the top is golden brown, about 35 to 40 minutes. Let cool on a rack for 15 minutes. Remove tart ring. Serve warm or at room temperature. Beat together the butter and sugar in a medium-size bowl until creamy. Add the salt, vanilla and egg yolk and mix until completely combined. Add the flour and mix until there are no dry patches. wrap the ball of dough in plastic wrap and press into a 4" disk. Chill several hours or overnight until firm. Place the dough between two pieces of parchment paper, lightly dusting the dough with some flour. Roll out the dough into a 12 inch circle. The parchment paper will make the dough easier to roll out. Chill the sheet of dough inside the parchment paper for a few minutes. Remove the top sheet of paper and invert the dough into a 10 inch tart pan. Peel off the remaining piece of paper, press the dough into the corners of the pan and pinch off any dough overhang. Use the dough scraps to patch any cracks. Let the tart shell rest in the freezer for 10 minutes before baking. Preheat the oven to 350 degrees. Transfer the the tart directly from the freezer to the oven. Bake until slightly golden, about 15 minutes. Check the pastry halfway through baking and pat down any bubbles that may have formed. Let cool before filling. That... is...Gorgeous!! Who wouldn't want to try this? Your photo's make me crave this right now! That first picture made me week in the knees! Plum tarts are among my favorites! Lip smacking! Wow that plum tart looks mouthwattering. The plums you used are they fully ripped ones? but if yu send me the shell, i'll do the rest! Happy Cook: Yes, they are fully ripe, but firm plums. Fret: Aw, come on...you can do it! It's super easy! I have just tried it. I modified the dough recipe a little, as I accidentally added an entire egg, not just a yolk, so I incresed the amount of flour (50 grams more). And the dough was extremely soft and tender, which was quite unusual for me. I also held it in the oven for half an hour, which did no harm. In fact it worked out absolutely delicious! One of the best recipes for me. Try it, it will work for everyone else. I had a ton of fresh picked plums that needed to be eaten. This dish surprised me and my husband. First of all I would like to say that I made two plum tarts for a friends party and they were a real sensation! I made them early the day of her party. I am having a party on Saturday, and to save myself some time, I wanted to know if I could make the tarts a day or so ahead? If so, should I freeze them, refrigerate them, or let them rest covered in cool place? Gail: The tart is certainly best the day it is made but I think making it the day before would be alright. I would refrigerate it overnight to keep the filling fresh. Thank you Elaine. I will definitely try that. I will let you know how they turn out. Thanks a bunch! I"m wondering if I have to cook the tart dough all the way before adding the filling. I want to finally try this while we are in plum season. Angela: In the recipe for the tart shell, it says to bake 15 minutes until golden. At this point, it will not be cooked through but will continue to cook after it's filled and baked further. Hope you like it! I wonder if plums should taste sweet or it doesn't really matter. The thing is the plums I've got are sour and I'm afraid it will spoil the whole thing. Unless you take the foil off, it won’t brown. Do you find that it is difficult to slice neatly and that the centre can be a little too runny..? If so. What do you advise..?